Gin and tonics are about as complex a cocktail as you can get from two ingredients. Now I better understand why. Bacardi is running a pretty cool program to push one of its gins: it's offering the chance for 10 bars each in 10 cities to make their own house tonic water, at Bacardi's expense. It seems like a win-win promotion: 100 bars get the DYI cachet of their own house tonic. Bacardi pays for the tonic water, but likely sells more of its Bombay Sapphire East gin, although the bar can do anything it wants with the tonic. I tagged along last week at Chino, a bar/restaurant I like in my neighborhood in San Francisco. 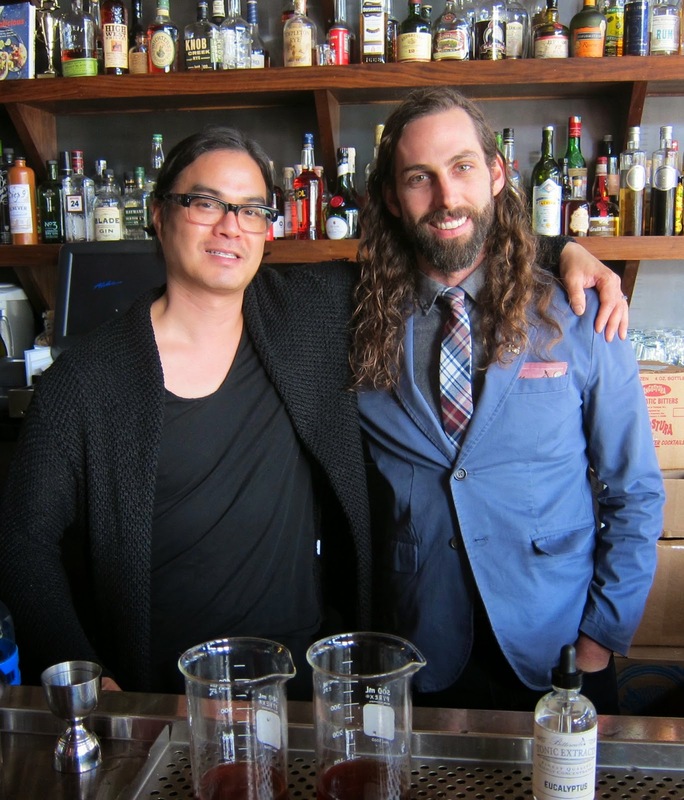 Bar manager Danny Louie and I both made our own tonics. We started with a syrup Louie made from Demerara sugar and added a few drops of quinine and citric acid. Then we had our choice of a dozen essences that a Wisconsin company called Bittercube produces. Some were exotic and seemed right for Chino's menu: Thai lemongrass and Vietnamese black peppercorn. The only G&T ever made with my tonic formula. It was good. I chose yuzu, ginger and bergamot initially. I love yuzu, it has the bright flavors of orange with some of the complexity and bitterness of lime. Essence of ginger is a lot different than ginger juice. The peel is included and the result is much earthier and less stinging. Bergamot, well, I like Earl Grey tea. My mixture wasn't sharp enough, so I added more citric acid, a few more drops of each essence, and a little jasmine, a fecund floral scent that reminded me of necking in high school. Which is exactly what you want to think about while drinking a gin and tonic. I was initially proud of my mixture, but I'm not a professional bartender. Danny Louie used yuzu, elderflower and eucalyptus and his tonic was terrific. The eucalyptus really made it, adding a breathtaking winteriness to the mix. When I smelled just the essence, the eucalyptus reminded me of medicine and floor cleaner. It took a professional bartender to see how a little of that would shine in the finished drink. Sometime this spring you'll be able to try Louie's tonic at Chino (get the dumplings.) Nobody else will ever try mine. Somehow the world will go on. Want to make a better gin-and-tonic? Here are 10 easy steps that don't require making your own tonic water. I too make my own tonic water. Well, technically it's a syrup that I add soda to and it's Jeffrey Morgenthaler's recipe (version 2 from his new book). What form of cinchona bark do you use? I'm not sure whether or not it makes a taste difference if it's powdered or cut and sifted, but it really makes a difference when it comes to filtering. Thanks for the article. I'm looking forward to trying out your suggestions. That really sounds like fun, to have made your own tonic. I use Q tonic which has a light taste, to me. The ubiquitous HFCS is just dreadful, no?